There are two kinds of emailers: Filers, who meticulously file away their messages into folders, and Dumpers, who just keep everything in one vast Inbox and rely on search to find messages they want. Nisus’s InfoClick has something to offer both of them, but particularly the latter. 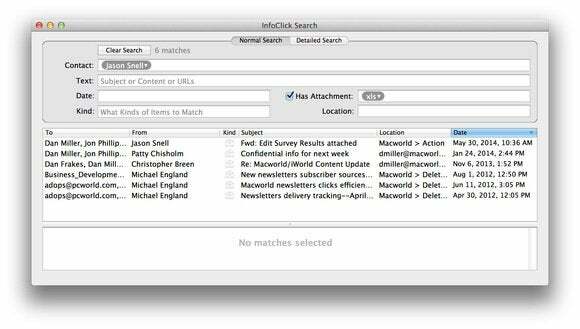 InfoClick is essentially a supercharged search tool for Mail. (Note that it’s a separate application on its own, not a Mail plug-in.) When you first launch it, it indexes all of the messages in your various mailboxes. (It took roughly 15 minutes to do this on my 75,000 messages.) Once that indexing is done, you can use InfoClick’s Normal interface, which includes six search fields: contact (who sent or received the message); text (in the subject or content of the message); date (year, month, or day); kind (sent, received, trashed, and so on); attachments (including file name); and location (the mailbox where the message(s) are stored). There’s also a Detailed Search interface, which offers those same search options in their own specific search fields (email account; contacts in CC: and BCC: fields; and so on). In both interfaces, there are three panes: One for search criteria; a second for matched messages; and a third for message previews. While you can read those matches in the preview pane, you can also open them in Mail by double-clicking. Of course, you can use Spotlight to find emails, and Mail’s own built-in search tools are already pretty good (once you learn how to take advantage of them). But if those tools aren’t enough for you, InfoClick offers way more power than either. It allows you to construct more tightly defined searches (messages with a specific file-attachment, on which your boss was copied, but not directly addressed, say). It also offers a Not switch (so you can find all messages with a particular attachment that didn’t go to your boss). InfoClick could, however, be easier to use. While the app adds a Find Email using InfoClick entry to the Services menu, it’d be nice if it integrated more fully with Mail. It would be even nicer if there were some way to save searches for future reuse. But, whether you’re a Filer or a Dumper, if you find yourself constantly searching for (and not finding) messages in Mail, InfoClick could make your life a lot easier.